White Carrara Marble Countertop would be a unique application for your kitchen remodeling:White Carrara Marble has soft linear looking veins in cold tones like gray or blue tones and White Carrara Marble competes with Calacatta Gold Marble. White Carrara Marble has an impressive history since Ancient Roman Era. If you like the history and would like to marry it with modern times, White Carrara is your bride. She is like a wine, when she gets older her beauty is getting more attractive. Your love is multiplied every day when you have this divine spirit. White Carrara comes from the heart of Tuscany, Italy.Her other very well known name is Bianco Carrara. Her other sisters are Statuario or Statuarietto, Ventino and Calacatta Gold. She always competes with Calacatta Gold, and sometimes some rivalry happens. To reduce this jealousy, it is good to know the main characteristics of both marbles. White Carrara has softer vein in more cold tones like gray or blue when Calacatta Gold has some bolder veins in more warm tones like golden grays. While White Carrara has more linear looking veins, callacata gold has cloudy veins. In this condition both sisters can be loved in your kitchen remodeling process with your demand. As I mentioned in my Calacatta Gold Marble article, sealing should be questioning. Please make sure your installation company seals your stone at the store and at your home. Then you can use Stone Tech Bullet Proof Sealer or Miracle 511 Porous Plus Sealer to make your bride more dressed up with fancy looking and less vulnerable. Do not forget that, she is very soft as like as your personality and she will show her aging like you when the time passes by. For my opinion honed White Carrara is a good match for white, light gray or green, basalt gray, walnut and chestnut cabinets. As like as her sister, She may be a good addition for your flooring ideas, wall tiling and wall covering. She is good with any gray tone or blue tone backsplash. She is also such a good selection for your floor tiling or wall tiling. My picks for your reviews are waiting for you, hope you like them and share your comments with me. White Carrara Countertop Combines Well With Concrete Ceasar Stone. Picture Credit: Studio S Squared Architecture Inc . White Carrara Marble Countertop combines with Concrete Ceasar stone Countertop. 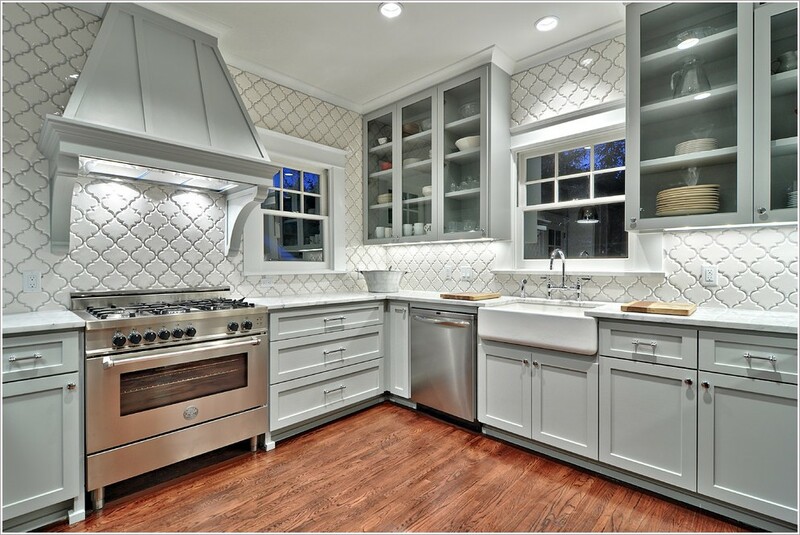 White cabinets and white ceramic subway tiles contrast enough with flooring and island. The natural light of kitchen is very catchy . Very nice design . Picture Credit: Risa Boyer Architecture , Dark color cabinets meet the white carrara full high backsplash and countertop. The oak kitchen island and flooring embellished with golden pendant. Mesmerizing kitchen. Picture Credit: Castanes Architechts PS via Houzz, Honed white carrara marble is used for full high backsplash, countertop and breakfast island with waterfall ( mitered ) edge. Cherry cabinets , stainless steel appliances and stainless steel pendants are all in good coordination. I really would like knead a bread dough in this kitchen. Congratulations, you design my dream kitchen.